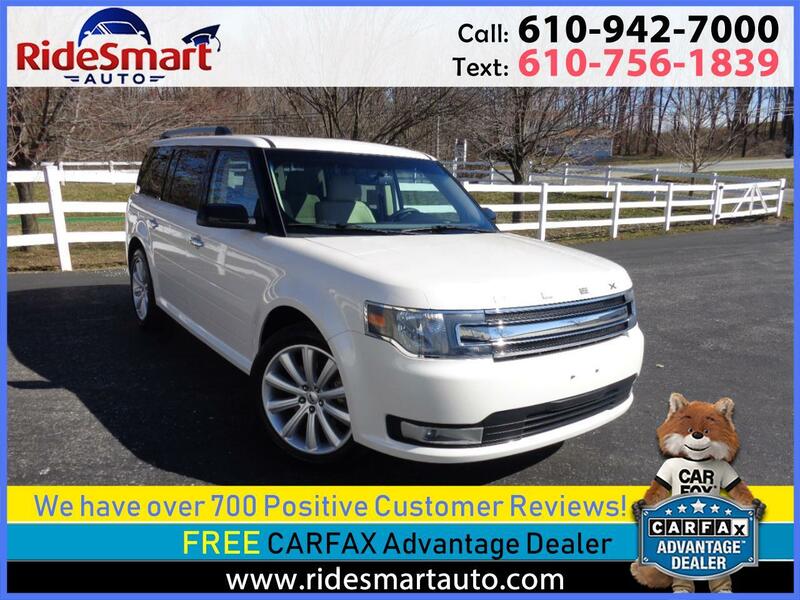 Spotless Condition/Garage Kept * 2015 Ford Flex SEL * Gorgeous Pearl White Metallic * 1 Owner 39,904 Miles * 6 Cylinder Engine * Leather-Navigation * Pano Sunroof * 3rd Seat * Backup Camera * Transferable Factory Warranty * Easy Instant Financing! Leather interior Navigation Bluetooth connectivity backup camera Lane departure rear defroster keyless entry power driver seat & more. The Pearl White Metallic Finish is in outstanding condition with no significant nicks dings or scratches. The Medium Tan Leather interior is odor free and spotless. It still looks and smells like new leather! This vehicle has a new PA safety inspection and balance of all transferable manufactures warranty to the new owner. There is a complete set of owners manuals/warranty books 2 sets of keys and a full set of floor mats. Air Conditioning,Alarm System,AM/FM,Anti-Lock Brakes,Automatic Climate Control,Automatic Headlights,Aux Audio Jack,Back Up Sonar,Backup Camera,Bluetooth,Bucket Seats,Cargo Area Tiedowns,CD,Child Safety Door Locks,Cruise Control,Daytime Running Lights,Driver Airbag,Driver Multi-Adjustable Power Seat,Electronic Brake Assistance,Extra Keys,Fog Lights,Front Side Airbag with Head Protection,Handsfree Wireless,Heated Exterior Mirror,Heated Seats,High Intensity Discharge Headlights,Interval Wipers,Keyless Entry,Leather Seats,Leather Steering Wheel,Load Bearing Exterior Rack,Luggage Rack,MP3 CD Player,Navigation,Owners Manual,Passenger Airbag,Passenger Multi-Adjustable Power Seat,Power Brakes,Power Locks,Power Mirrors,Power Seats,Power Steering,Power Windows,Rain Sensing Wipers,Rear Air,Rear Airbags,Rear Defroster,Rear Spoiler,Rear Wiper,Remote Ignition,Run Flat Tires,Satellite Radio,Second Row Folding Seat,Separate Driver/Front Passenger Climate Controls,Side Head Curtain Airbag,Skid Plate,Steering Wheel Mounted Controls,Tachometer,Telematics System,Telescopic Steering Column,Tilt Wheel,Tinted Windows,Tire Pressure Monitor,Traction Control,Trip Computer,Vehicle Stability Control System,4WD/AWD,ABS Brakes,AM/FM Radio,Deep Tinted Glass,Lane Departure,Premium Aluminum Wheels,Rear Window Defogger,Tilt Steering Column,Vehicle Anti-Theft.